I was hoping that I could distribute this flyer via public elementary school, but one of the superintendents said "School cannot promote this camp because of the connection to religion which may be issued." I think what he said was right as a superintendent. But I cannot give up promoting this program to children because the reason I wanted to have this camp is for educational purpose. I wanted to provide the opportunity for children to experience Japanese language and its culture, and fun, too. It is my belief that education for children is much more important than religion; Religion is necessary for adults; the older he or she becomes, the more they need....that's religion. As children need to learn various things widely, they should not stick to one religion (I think I am very brave.) So I don't have any intention to start or promote religious Sunday School for children here, rather I'd like to teach more languages and cultures to children. And if you know more foreign languages, you will know your own language more as I knew more of Japanese by learning English, Chinese, French and Italian a little. I am now learning Hawaiian culture. So I decided to change the program. I took a few religious words out. Fortunately, our temple has two IDs. One is a Buddhist temple as a religious organization. And another ID is a place to learn Japanese Culture. 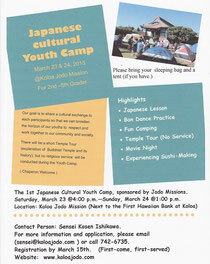 So this time, I will do this camp not as a Buddhist Sensei, but as a Japanese Sensei. So anyone who think this intention is right, please help me to let Kauai parents to know this program. Needless to say, keiki (children) is our treasure. Our future is depending upon them. It doesn't matter which religion we believe, but we adults, need to lead them to be better. Lastly, I'd like to share words by a legendary Chinese politician Kuan Chung (c.? -645BC) , known as Kanchu in Japanese. 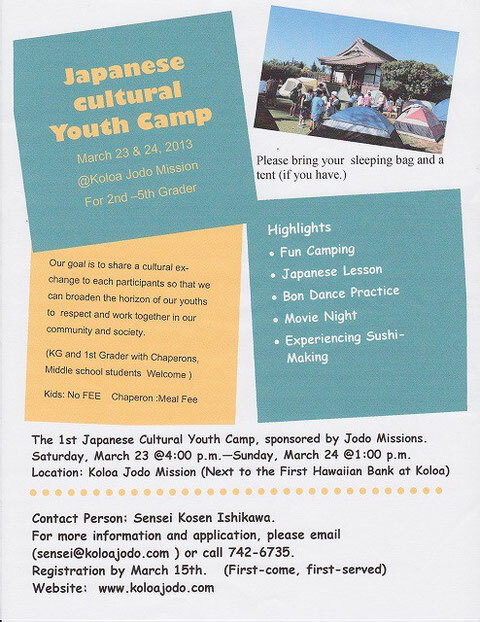 As a Koloa resident and close friend of the Ishikawa's and the Koloa Jodo Mission, I am excited about the Japanese Cultural Youth Camp being offered for the first time this spring. I have never heard of such an idea, even coming from the mainland, Los Angeles, California. My daughter attended a Japanese Language School in Gardena and never learned about how to make sushi or dance. This is a brilliant idea! A unique opportunity for a brief introduction of the Japanese language and culture. The children will enjoy learning, experiencing something new, in a safe environment. I believe this will be a start of a good thing in the Koloa community! I encourage all who are interested to register soon, as tents are filling up! Thank you so much for leaving a good comment. I also appreciate your words of encouragement. I am hoping I'd spend more time for our community.